Like a behavioral interview, during situational interview candidates are asked specific questions about what may happen on a job. The candidate is asked to assess a situation and to provide solutions on how he or she would handle it. In many cases, situation based interview questions involve problem-solving and handling difficult issues and circumstances in the workplace. 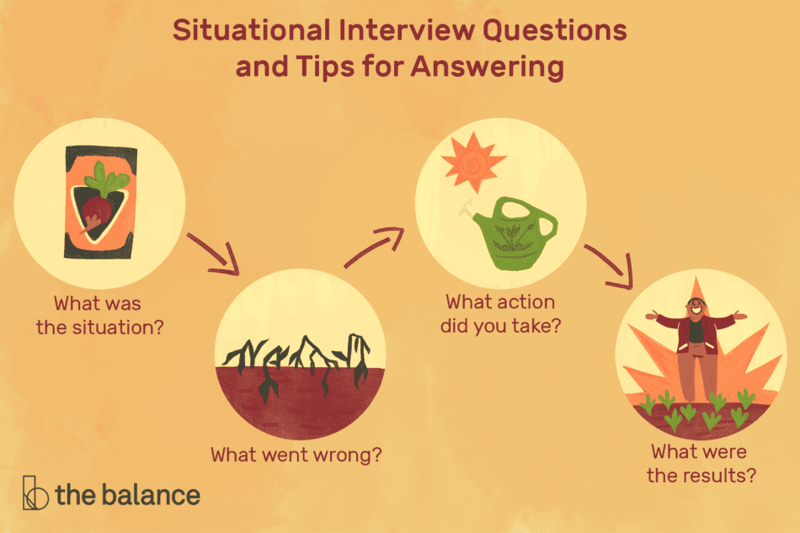 You can share some details about how you anticipate you would respond to the situation, but the best answers to situational interview questions provide concrete examples of how you handled a similar situation on the job. That way, you're providing the interviewer with solid information on how you would handle the situation. Your main goal in responding to the questions in a situational interview is to describe a similar experience in the past. To do this, use a version of the STAR technique. That's an acronym that stands for Situation, Task, Action, Result. What was the situation? Before launching into what you did, take the time to describe the situation. Include the kind of company, what was at stake, and what the process was. For example, a description of the situation could be, "In my past role, I was in charge of a major event, one of our biggest fundraisers of the year. It typically had hundreds of guests and brought in thousands of dollars for the organization. It was my job to plan the event, including securing the venue and guest speaker." What went wrong? Describe what went wrong and how it happened. Was it something avoidable, or was it an unexpected crisis? Using the above example, you could say, "Just three days before the event, our keynote speaker became ill and canceled on us. Our speaker is the biggest draw for the event, so not having her was disastrous. If we canceled the event, we would lose thousands of dollars, but if we didn't have a speaker, we risked angering our audience." What action did you take? Describe not only what action you took, but your rationale behind it and how you identified solutions. For instance, "I conferred with my boss, and we discussed our options. Canceling the event was out of the question, we would lose too much money, so our only option was to find a new speaker. I spent the next ten hours on the phone non-stop, calling ever speakers' bureau in the region and sending emails to everyone I knew who could help. It was grueling, but the work paid off." What were the results? Highlight what you accomplished and how it helped the overall project. "My persistence ended up working. After chasing down one company, I was able to secure a new speaker for the same cost we were going to pay the original one. We sent out a communication letting attendees know about the change and highlighted the achievements of our new speaker. It turned out to be our best event yet; we earned $10,000 more than we did the year prior." As you respond to questions, keep in mind the core skills and abilities that are required for the position. Try to use your responses to show that you are a good fit. The following are examples of situational interview questions, along with sample answers and tips on the best way to answer.